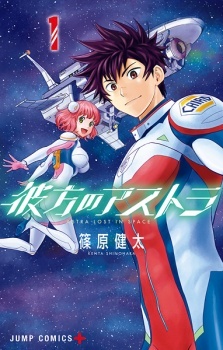 Kanata no Astra has been published in English as Astra Lost in Space by VIZ Media since December 5, 2017. Looking for the journey of space which is exciting and pump up your adrenaline? Then, Kanata no Astra is your answer. Kanata no Astra has a unique way to show the enjoyment for those who read it without heavy atmosphere. They lost in space and must survive in it. The author is really well-known with his long-running gag and touching series, Sket Dance. And I’m one of those people who is excited because he is comeback with new series. It ends in 5 volumes only, but it really is worth your time. At first, I’m afraid to try, because I don’t really like space themes (exceptional case is Uchuu Kyoudai which I really love the most so far). I’m skeptic, I though it will turn out boring. And the result is, I was wrong! It maybe doesn’t explain in detail about space or whatsoever like how Uchuu Kyoudai did, but that’s not bad, it explains some important parts without unnecessary outcome. I like the story how it provides in limit you can understand and follow the story. It’s different with any kind of survival concepts, where they try to kill each other, full gore, and else. Also, I thought first it will turn out like this : something bizarre comes up – they sucked up – they lost nowhere – they found the space ship without someone in it – then they must survive in it – they are panic and make everything worsen. Again, my assumption was wrong; they will go find a way, an idea to go home but they end up in a mysterious place, they must searching for foods and waters as much as they can hold, then they work out together as a team. The jokes are flowing too, the very first chapter is really good, which makes you laugh so hard. The jokes style really reminds me with Sket-Dan. At the same time the danger always kept following them, you can feel the tense! That’s so good. It goes well without much effort. It doesn’t have an amazing development, but I like how the characters are helping each other, sometimes there is small quarrel, or when they positioned themselves which doesn’t make them useless so bad (every one of them has ability to through the problems). For example Aries, a klutz and a straight-forward girl; she is useful, her brain works even if she looks so useless. Kanata, a stupid captain, a reincarnation of Bossun; he is brave and his experiences help him a lot. Zack is quite a serious persons, he looks like big brother who can depend on. Also a hot looking guy, Charce, but unfortunately he has worst personality. Which I really like the most despite the intriguing story and the jokes is, how Shinohara-sensei always put a massage in it. Like Sket-Dan with its friendship matters, a meaningful purpose for those who read it, a dream that encouraging the youths. I like how the story has a resolution instead messed up with unnecessary plots and ideas, and through more than 10-20 volumes. This Manga is not what it seems like. Its so much more! What i loved the most was the Type of Story Telling, which is very reminiscent of Manga Titles like Yakusoku no Neverland or Shingeki no Kyojin. What i mean by that is that the Story is told from the Perspective of Characters that have very limited knowledge about the Truth of the World, which hides Secrets that one would never have expected. What seemed like a Space Slice of Life that raised a couple of seemingly unimportant Questions at the start, and continues to portray this image until halfway through the Manga with a few annoying Characters and Dialogue quickly develops into a brilliant Story revolving around Conspiracy and Secrets. I would have never. Never expected the direction this Manga was going to take. Honestly the 2nd Half of the Show portrays a completely different Array of Emotions, it seems like a completely different Story. I like to compare the Manga to a rollercoaster because initially you are elevated slowly and once it starts rolling you end up in an intense journey of excitement. I shed tears, my heart beat faster with every Chapter that i was reading. When the Plot Twists start piling up you will not be able to stop reading. The Story was therefore a solid 10. The Art, well i really enjoyed it although its nowhere near as Unique as Hajime Isayama or Yusuke Murata, its still absolutely solid and does a great Job at hiding the Insane Story through its simplistic and innocent design. The only thing i did not like was that some of the Characters were annoying during the first half of the Show, there was some Dialogue bothering me, but i quickly forgot about that and honestly they were extremely minor issues, but i had to mention something negative. My Overall Enjoyment was therefore a solid 10. I simply hope more people pick up this Manga as the TV Adaptation will be Airing this Summer. Hopefully it delivers, im excited to watch that one as well, so if the Voice Acting, Music and Animation is on point i wouldn't be surprised to see this Story gain immense popularity, because i felt its underread, but incredibly loved by a select few. I came across this series right after consuming one of SJ’s recent series The Promised Neverland. A friend I know on Twitter recommended two titles to me, Kimetsu no Yaiba and Astra Lost in Space. The latter was the one he loved the most and he told me it was a more obscure SJ title that has yet to see deserved praise. Given my sense of empathy, I wanted to look into Astra Lost in Space first to see if I would love it as my friend. I was highly impressed with the art and character design, immediately thinking about why this has become notable to the manga community. Astra Lost in Space does start out fairly generic with a nice little premise about nine kids being mysteriously sent to space, wanting to return to their home planet. As the chapters progress, I gradually started to get attached to the characters. The combination of teamwork and leadership with the element of survival on an unknown planet created intrigue and decent character development. As the story progresses (Particularly in the halfway point), the plot starts to really kick in with so many plot twists that made all of the character development more impactful. The connections the kids have had some of the most intense moments that highly entertained me and had me caring for the characters by a big degree. Reading that last chapter, seeing everyone happy with things back to normal, I could not help but feel empty. Astra Lost in Space is a short, but powerful journey about friendship. I highly recommend reading the entire series in a day, as the manga has only 49 chapters. Give it time to let its story take loose, and I can guarantee you will be hooked to the end. I really hope to see an anime adaptation in 2018, because the creator (Kenta Shinomura) deserves to earn many rewards for creating a fantastic manga. I look forward to his next work. I hope his new series will follow similarly to Astra in terms of focusing on great character development and story. Astra Lost In Space is the first manga I pick to read from the new Shonen Jump app, I didn't truly know what to expect but it quickly become one my all time favorite manga stories. Astra Lost in Space is perfect space adventure!! Lots of fun twists and turns!! I love how it actually felt like a space story, and centers on different planets and exportation and that survival is key, it was fast moving story with lots of cliffhanger moments, a really nice thriller too. The characters really fit together, and it wasn't just other space adventure or even love story, sometimes those moments take away from the space adventure or key characters. Overall I really love this manga, and I am happy it's getting made into anime! !